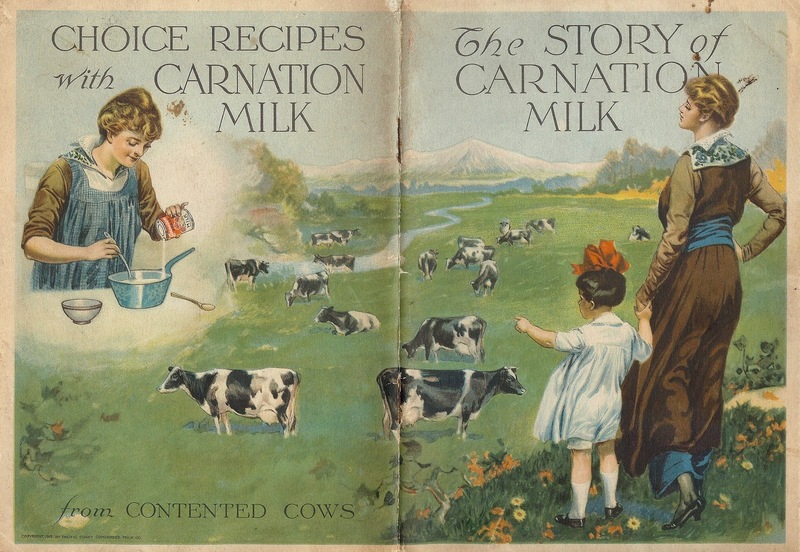 “The Story of Carnation Milk” was published in Seattle in 1915, a 32-page illustrated booklet of recipes prefaced by a paean to milk in general and to “condensed” milk in particular. The publisher was the Pacific Coast Condensed Milk Company, operator of fifteen Carnation condensaries, all located “far from city soot and manufacturing impurities, all located in the hearts of splendid milk producing sections, …literally ‘among the hills.’” Well, perhaps some of them were. The first plant of the Pacific Coast Condensed Milk was opened in Kent, Washington, in 1899 by Elbridge Stuart. However, the marketing heart of the company was the Carnation Stock Farm, “Home of Contented Cows.” To the east of Lake Washington near the town of Tolt, Stuart established the farm in 1910 with a bull and 86 Holstein cows; in 1917, Tolt was renamed Carnation. Pacific Coast also had a condensary near Forest Grove, Oregon; the railroad stop and post office there were also named Carnation. A photograph of the plant appears in The Oregon Companion on page 140. A century ago, condensed milk had two major assets going for it. It did not need refrigeration, an important consideration in an era when even ice boxes were far from universal in homes. (This quality was handy, too, on the Chilkoot Trail while searching for Yukon gold; it weighed less than fresh milk, too!). And, in an era when tuberculosis and other diseases were too often transmitted through raw milk, condensed milk was pasteurized and “pure.” Recipe booklets like this promoted the use of a new form of an age-old ingredient, selling it with imagery of neatness and cleanliness, and of Pacific Northwest scenery in green, blue and white. Carnation became a brand of Nestlé in 1985.